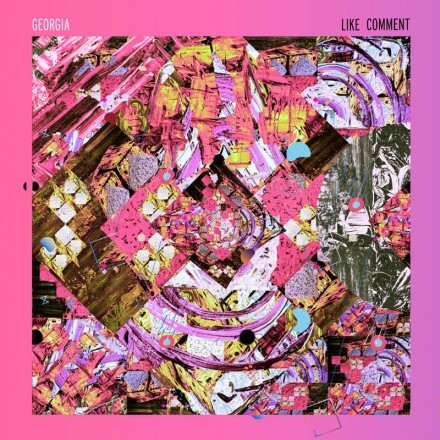 Brian Tripp and Brian Close offer up their second album as Georgia for Meakusma, managing to pull off once again a bewildering mix of hazy hypnagogic pop, computer music, and analogue dance music. ‘Spirit House’ is a mangled ‘80s TV-theme, complete with distant cackles and jazz flute interjections, while ‘Nu-Way Heat’ is the missing link between Toto’s ‘Africa’ and a L.I.E.S. analogue chug. It is the album’s bookends which impress most though, with ultra-precise glitch material flocking into strange patterns which resemble some kind of footwork fit, but carried off with a lightness of touch fitting with the rest of this charmingly bonkers album. Chinatown, NY’s Brian Close and Justin Tripp, weigh up a 2nd album of quirky 4th world sonics mixing Krautrock, Afrobeat and electronica, marking meakusma’s first full length release. The sound of ‘Mahbunzi Mahgo Pihndi Goes To Market’ is very much symbolised by the artwork – a collage of colourfully fractal geometries somewhere between a circuit board and psychedelic African print pattern highly reflective of the music within. Over nine tracks they deftly gyrate and tesselate limber bass, exotic bird calls, sweet Yamaha DX7 keys and synth voices in a laidback, sun-blessed melange of grooves at once reminding of Pekka Airiksinen’s wild jazz improvisations, the mellow grooves of MvO Trio, and the beaming happiness of William Onyeabor minus the vocals, all making for a heady and delightful experience. Regisseure, Motion Graphic Designer, Filmemacher, Sound Designer, Produktionsstudio und Musiker – Brian Close und Justin Tripp alias Georgia sind die Interdisziplinarität in Form eines Kreativduos, die sich auch schon für Julia Holter oder Lee „Scratch“ Perry austobten. Meakusma veröffentlicht nun ihr zweites Album, das erste namens Asemic Club erschien 2012 auf ihrem eigenen Label. Wenn man Georgias Portfolio anschaut, scheinen die beiden 24 Stunden am Tag Ideen abzufeuern und die insgesamt acht Lieder ähneln deshalb auch aufgeblühten Spielwiesen: In jedem Track treffen sich völlig abwegige Samples und Improvisationen, die dann eine ungehemmte Party feiern. Auf „Abstract High“ etwa kommen ein Synth, eine Posaune und ein Konfettibeutel auf einem Kindergeburtstag zusammen und beschließen, gemeinsam in den Club zu gehen. Nur der Takt blitzt hin und wieder auf und hält den bunten Reigen gerade so zusammen. „Haya“ ist esoterisch angehaucht und obwohl Panflöten eigentlich zu den größten instrumentellen Verbrechen gehören, klingen sie hier sogar gut! „Spirit House“ in seiner Geradlinigkeit ist der normalste Track der Platte – obwohl „normal“ in diesem Zusammenhang ziemlich relativ ist. Der erste Langspieler auf Meakusma ist ein krudes, abstruses und freies Gesamtwerk jenseits von Genrekategorien und eingeübten Zwängen. Wer sich gerne auf Experimente einlässt, ist hier richtig. Given that the Georgia pairing of Brian Close and Justin Tripp count music production as just part of their creative repertoire alongside motion graphics, music videos and other visual projects (for artists like David Byrne, Lee Perry and Julia Holter), it’s perhaps not surprising that the duo chose to take full creative control of Like Comment, their new album for the Meakusma label. Much like De Jong’s aforementioned work, there is just so much little detail within the bigger picture on both sides of the album sleeve that it’s quite hard to put it down.